The Chippewa Valley Free Clinic helps patients with long-term illnesses and problems, such as high blood pressure, asthma, diabetes, and depression. Vaccinations and treatments for minor short-term problems, (e.g., a cold, bronchitis, urinary tract infections, rashes, & flu) are also available. Simple lab tests can be done. Medications ordered by the Clinic doctor or nurse practitioner will be provided at the Clinic. The Clinic does NOT provide (a) physicals for Workman’s Compensation, (b) Commercial Driver’s License evaluations, (c) testing for STDs (sexually-transmitted diseases) and HIV/AIDS, (d) specialty care (e.g., OB/GYN, cancer) or (e) preventive procedures (e.g., mammogram, colonoscopy). The Clinic does its best to find available resources and/or refer those patients who need these services. Please see Community Healthcare Resources for additional services in the community. The Clinic does not dispense any controlled substances. All Clinic patients are welcome, including walk-in and ongoing/continuing patients. 2nd & 4th Thursday: 5-8 p.m.
1st & 3rd Thursday: 9 a.m.-1 p.m. The Dental Clinic is by appointment only. Healthier You: A no-cost weight program that includes coaching sessions, educational sessions, nutritional guidance, and more. Click here to learn more! 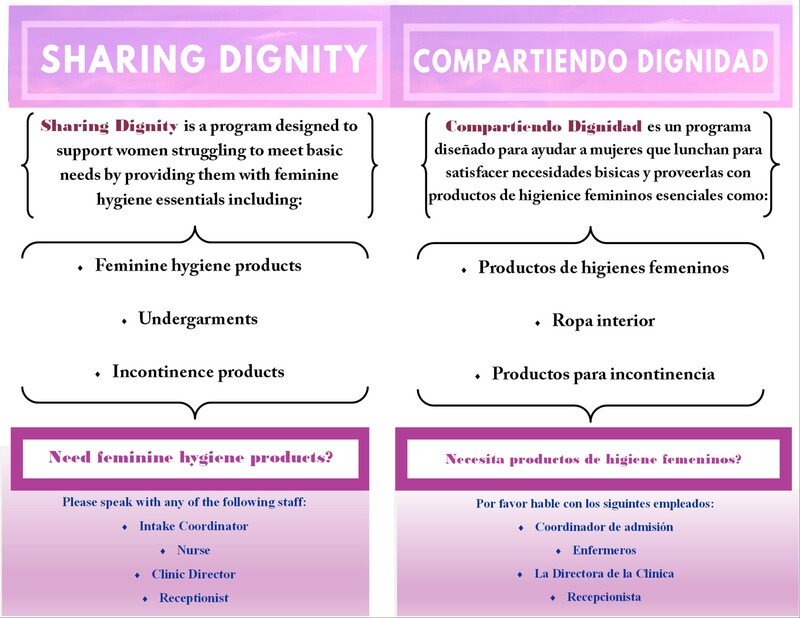 Sharing Dignity: A program designed to support women struggling to meet basic needs by providing them with feminine hygiene essencials. For more information, click here. If you are visiting the Clinic for the first time, your medications will be provided after you have been seen by a doctor or nurse practitioner (NP). Meeting with the doctor or NP and receiving your medications will both occur at your first visit. If you are a patient already established at the Clinic, you can have your medications re-filled at either the Tuesday Medical Clinic or at all Thursday clinics. To help decrease your waiting time, please call the Clinic AT LEAST 24 hours in advance before picking up your meds (715-839-8477). For example, we strongly recommend that you call no later than 12 p.m. on Monday if you plan to pick up your meds at the Tuesday afternoon clinic. Calling this far in advance will help our staff have your medications ready for you. 1st and 3rd Thursday of each month from 10-1p.m. 2nd and 4th Thursday of each month from 5:30-7p.m. Call at least 24 hours in advance. Walk-ins for medication refills will not be filled same day. See the Patient Handbook for more details.